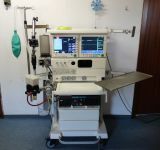 GE Datex Ohmeda Aestiva 5 Anesthesia Machine with 7900 ventilator. Over 20 units available. Excellent Condition. All units tested & certified with documentation. Both pre-owned & refurbished options available. Contact 305-595-3404 andy@imedequip.com.